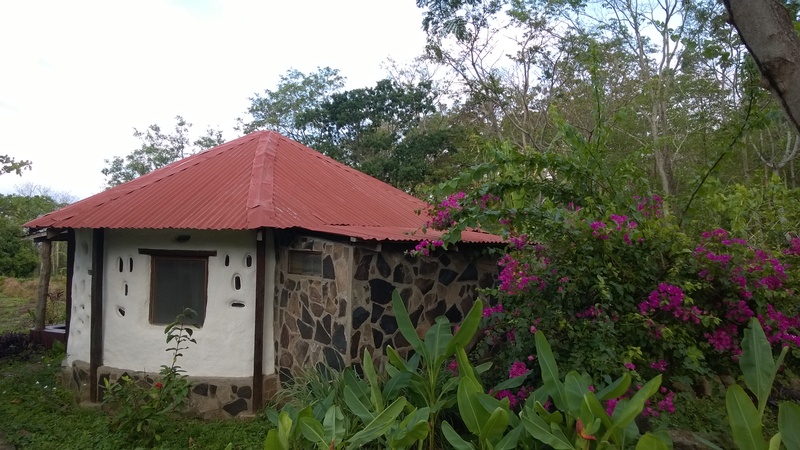 Well, we are right now literally in the middle of nowhere, a farm lodge called Finca Mystica (‘Mystical Farm’) in the volcanic island of Ometepe in Nicaragua. Within 10km radiance, there are just 7 human beings: the owners Ryan, Angela, Jazmine of their 6 mth old; Thomas another guest from France, and we three. 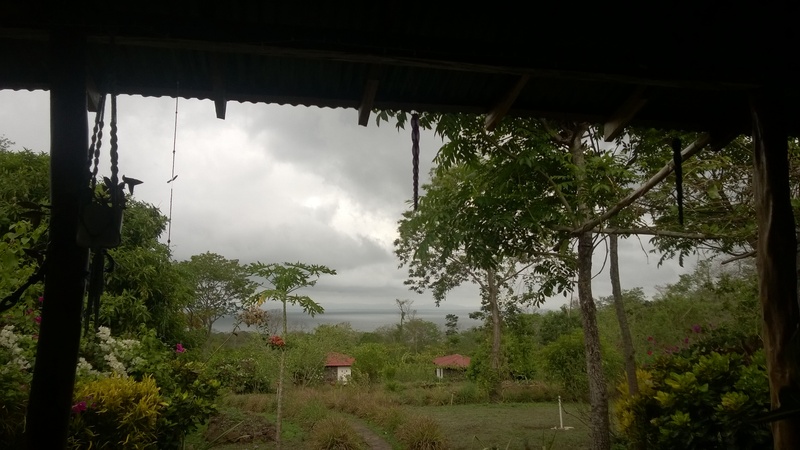 The rest are monkeys, fruit trees, trees, water from Nicaragua lake, and the two volcanoes that our island sits on. 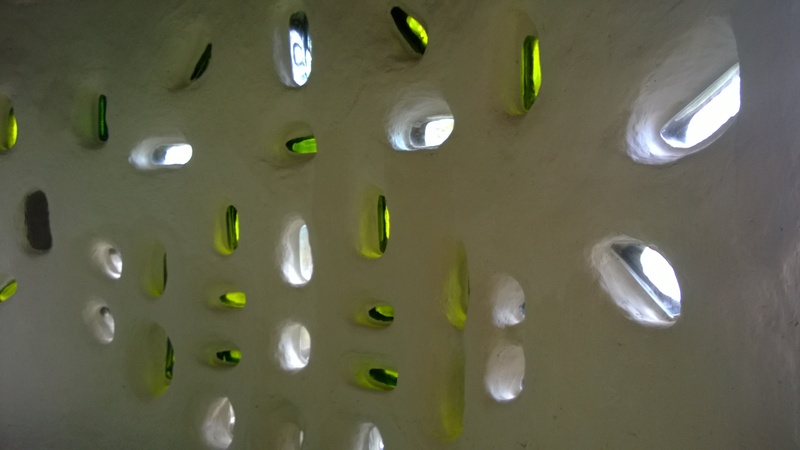 Its remoteness reminds us of the jungle lodge we stayed in Tasmania. We had quite a trek today from Granada to get here. 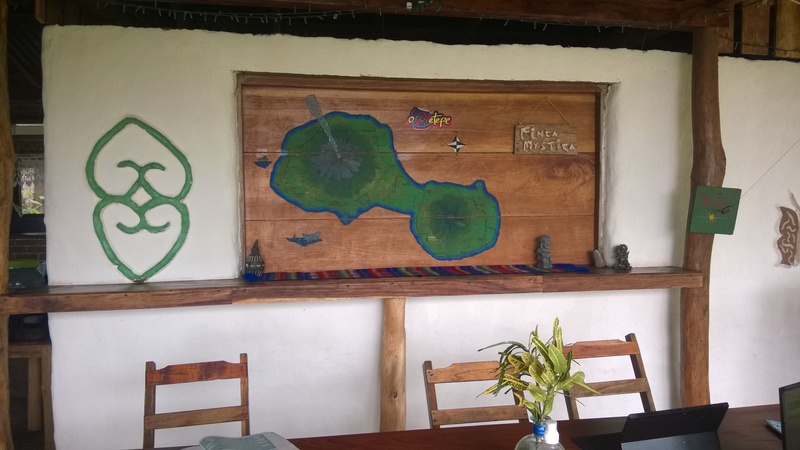 Ryan from Finca arranged a car/private taxi to pick us up from Casa del Aqua in Granada to the port of San Jorge (for US30 and less than an hour, we avoided ourselves the hassle of walk+bus+walk+bus/taxi that might take more than 2 hours). From there we took the 2:30pm ferry (a vehicle + passenger ferry that costed us 70 cordobas pp for the one-hour ride). At some point the water was so choppy (freaky to think about esp considering that it’s inside a LAKE, well the biggest lake in entire Central America that is) that water came right up to the second floor of the ferry, and the passengers sitting on window seats got sprayed. 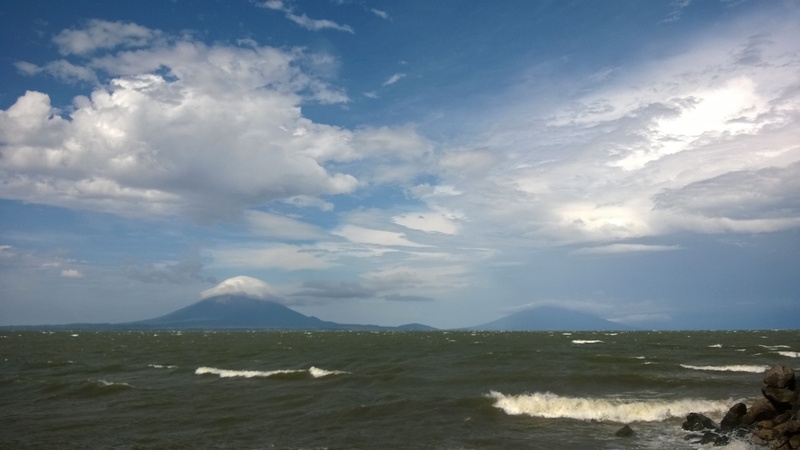 But the view was simply surreal: looking towards the Isla de Ometepe, I could see the twin volcanic islands soaring up, towards the iconic volcanic clouds. Once debarking on the port Moyogalpa, we had another smiling driver waiting for us to our taxi/private car arranged by Finca again. Well, this time the 4×4 not only was practical, it was almost the only choice. After 20min of paved road, we started a bumpy unpaved mountain roads for the next 30-45 min (I just couldn’t remember how long exactly it was, it seemed going on forever anyway). We passed through some houses, cultivated farms, a bit of beaches, a school, a few road side shops, but most of time just forest after forest. 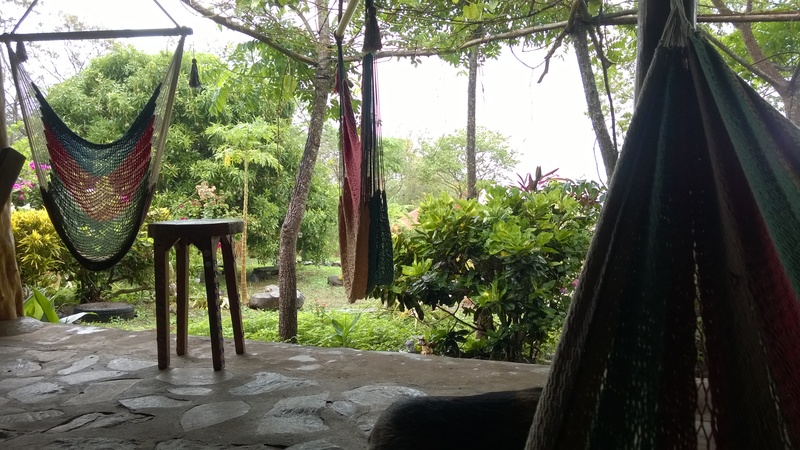 Finally after a long private drive way, we were greeted by the most gentle owner family of Ryan, Angela, Jazmine, and their dog and the howler monkeys. The journey itself was part of the experience, definitely the case here. 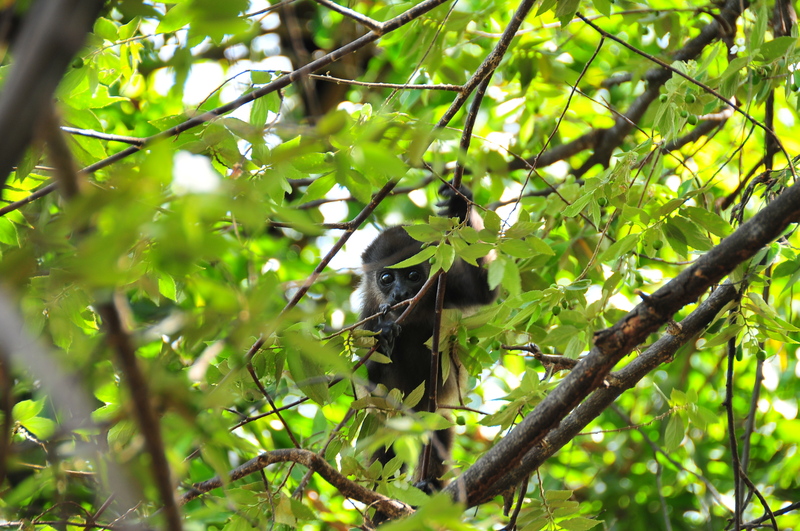 Howler monkeys reside on the farm land. I don’t know how many they are, but I saw 6 or 7 of them on the mango tree under which I was sitting on the hammock with Nina. They looked at us as intensely as we did them. The baby monkey was jumping around nonstop, while the mummy monkey was watching patiently. Exactly the behaviour of human being. At night these howling monkeys, well, howled. So loudly that I could almost distinguish from which tree they were. There wasn’t much to do really, esp for us who didn’t want to walk for kilometres with Nina in tow. 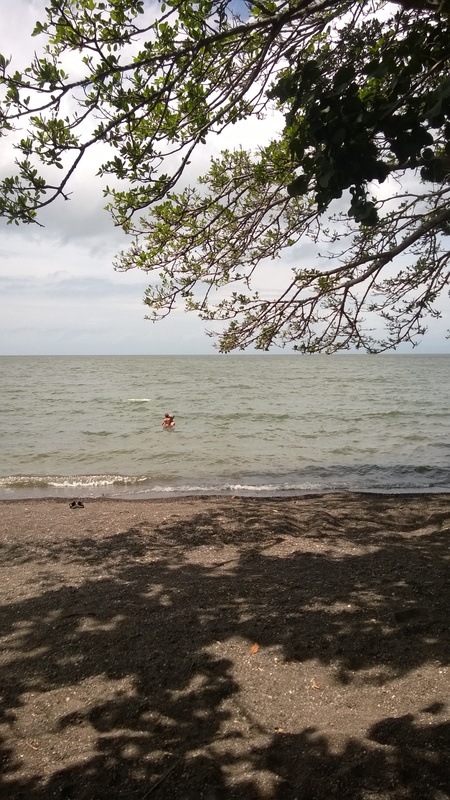 We walked down to the beach – not exactly white sand beach, but black volcano sand/rocks, much finer than the one on Luguna de Apoyo. The water was warm, but not clear – was it natural due to the sediments or colours of sand, or due to pollution brought in by boats? If the canal does come through one day through Lago de Nicaragua, there would be more blessings or problems? Well, there was the possibility of opening up a second canel connecting Pacific with Atlantic (the only one currently is the Panama canal), which would be founded by Chinese. I didn’t really know what to think about this. There wasn’t much to do around, and I was perfectly happy to just sit around in the hammock, watch birds, clouds, trees, and let time go by. 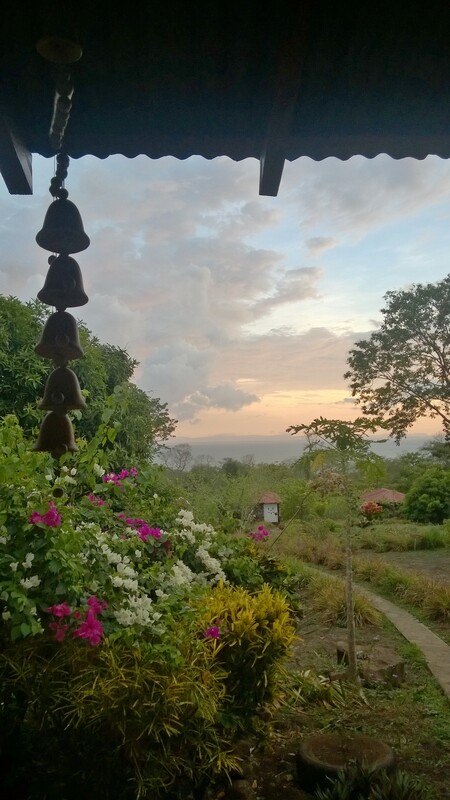 Hang around in the finca. Pouring rain whole day, much needed rain for the farmers. Everyone came out to plant seeds as they have been waiting for the rain to start. Ryan told us that they bought the farm/land about 6.5yrs ago. For the first few years, they would work 6mts in US (they are both from there) to earn enough money, and come here for 6 mths to build a bungalow, plant some fruit trees, and go back again. He used to live in Asia, and learnt how to use adobe to build houses, so he designed and built the houses himself with a crew of locals. Three yrs ago, they had enough bungalows (5 for guest rooms, 1 as common area/kitchen/dining/their own room) to start the guest house business. 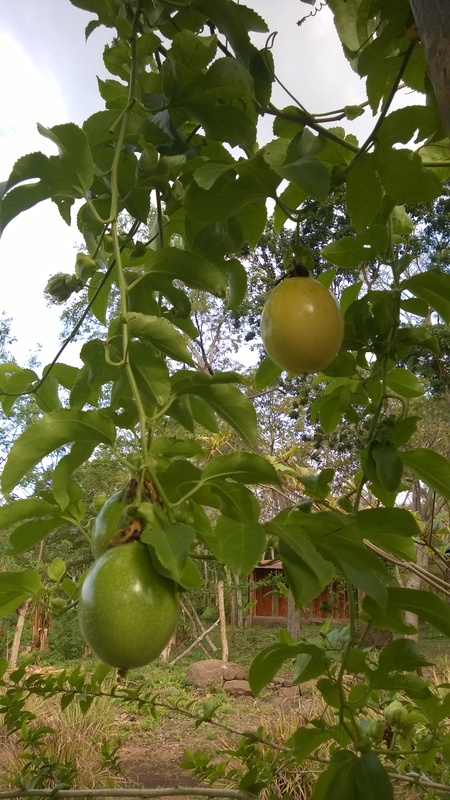 Now they have almost 100 types of fruit trees, including some exotic ones, such as sesame, Granada, star fruit, dragon fruit, nuts. Their rare failure includes durian (haha I wasn’t unhappy). He asked me which bamboo to plant in order to have bamboo shoots. I totally failed it, how do I ever explain 春笋，冬笋 etc (spring bamboo?? winter bamboo??) !! It’s a total madness to think how they managed to bring all that’s needed for these comfortable bungalows (mattress, flush toilets, furniture, etc) being such a long way (and bumpy way) from anywhere commercial. Looking at the lush farm, I had nothing but admiration to them. It’s a farm so there were many bugs around. Nico even found a scorpion like creature one morning right next to our bedside table. I guess we learnt to be zen – after all, they live here with a 6-mth-old, and they are thriving. Nina loved picking up mangos under the tree, or found 2 ripe Granada !! Lemon grass are their footpath border plant, I like the idea. Ryan and Angela seem to be serene people. Working and living on such a remote place certainly requires special traits. To do so happily, proudly, and successfully is not something everyone could manage. He proudly told me that they employ 12 local people , who in turn feel part of the finca and very proud. Once here, one doesn’t really have choice but to eat in their restaurant 3 times a day. All food is made from scratch daily, using as many ingredients from the farm as possible, including the daily baked bread, pancake etc. The home-made hibiscus ice tea was awesome, as well as maracuya juice. At night, it has to be the darkest place I be ever been to. Literally there is no light as soon as I turn off the light of our room. Not even distantly. Nothing. Pitch black. Period. It’s a cloudy night so not even moon light or stars. It’s such an unusual experience. Yet there is internet, not that you get strong signal, nor consistent, but it’s a working one! They have set up an antenna high enough to receive the signal … from the mainland! I am talking about the mainland that’s 1 hour boat ride away. Hence the quality. But still, there is enough to keep in touch with the rest of the world. Ryan and Angela managed their entire business online after all – they get bookings mostly online, through emails. He told me their bungalows were booked out most of time in the year. Without Internet it’s just unthinkable to have a successful business in such a remote place, regardless how wonderful the place is. Isn’t just amazing to think what technology could do?